Eleven years ago I went with my sister to the wedding of a friend. Actually, this girl was more than just a friend. She was one of those people who has been a part of my life all of hers. I’ve known her since she came home from the hospital the first time. She was a funny, rambunctious, outgoing little girl with glorious curly hair that her daddy wanted to keep long. This girl’s family lived across the street from us. Her older sister was my sister’s best friend and her older brother was my brother’s best friend. I’ve always been surprised the kids didn’t dig a tunnel under the street from one house to the other so they could get back and forth between the houses without running outside. Several years ago when my family’s van was hit by a drunk driver and we lost several family members, this girl and her family was there for us. Supporting us, loving us and grieving with us. The company she worked for even made a video about drinking and driving, dedicated to my sister’s daughters who died in the wreck. After the wedding, instead of rice or bird seed to toss at the couple, we were given little white bells to ring as the couple left. 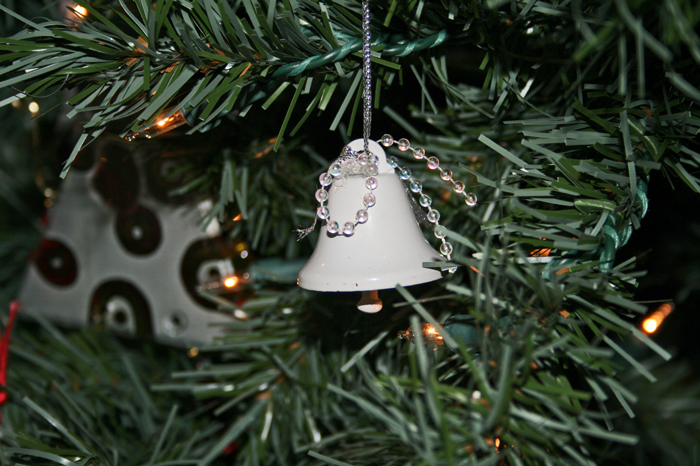 When I came home from the wedding, I hung the bell on my tree. Every year since, that bell has been on our tree. Anytime I hang an ornament that someone has given over the years on our tree, I say a little prayer for that person and her family. For the past ten years I’ve prayed for this woman and her beautiful family. Now if I can only get my tree out of the attic, I can make it eleven! When we get our tree out of the attic, I’ll find the bell, hang it on the tree and once more pray for this beautiful family. Categories: Small World, Small World Christmas | Tags: Christmas, Family, Home, Horticulture, Mother, Parent, Sibling, Tree | Permalink.